Will Oil Price Crash Lead to “Contagion” for the U.S. Stock Market? Oil’s crash is historic – this is the most oversold oil has been from 1983 – present. Will oil’s crash lead to “contagion” for the U.S. stock market? Meanwhile, some traders think that the S&P 500 is making an “inverted head and shoulders” bottoming pattern. *We usually ignore such chart patterns. These patterns work perfectly with 20/20 hindsight, but are no better than a coin toss in real-time. A quick glance at oil’s chart reveals how intense oil’s crash really is. Oil crashed more than -7% on Tuesday. Is this a sign of “capitulation selling”? Is oil’s bottom in? Here’s what happened next to oil when it crashed more than -6% to a 1 year low. As you can see, oil’s returns over the next 3 months lean bearish. But is this a bearish sign for the U.S. stock market? Will this lead to “contagion” for U.S. stocks? Here’s what happened next to the S&P 500 when oil crashed more than -6% to a 1 year low. As you can see, the stock market’s forward returns aren’t consistently bullish nor bearish. Oil’s crash is mostly an irrelevant factor for the stock market. The Russell 2000’s 50 day moving average will fall below its 200 day moving average tomorrow. This is called a “death cross”. Is this bearish for the stock market? 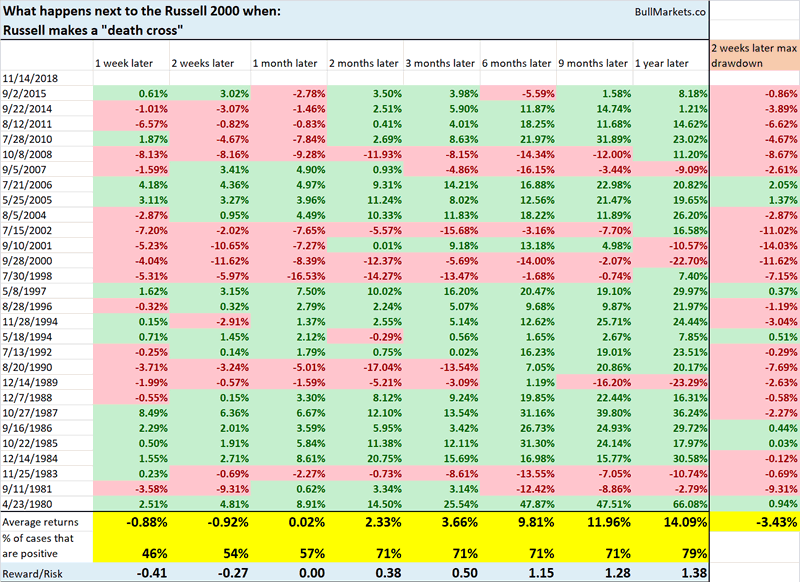 Here’s what the Russell 2000 did next when it made a “death cross”. As you can see, small caps can face short term weakness over the next 1-2 weeks, after which forward returns are neither consistently bullish nor bearish. This is a short term bearish sign for the stock market, but it doesn’t mean anything for the medium-long term. Here’s what happened next to the S&P when the Put/Call ratio’s 50 day moving average rose above 1.033 (first time in 1 month). As you can see, stocks tend to do well over the next 3 months. The sole bearish case was October 6, 2008, when the stock market had already crashed 30%+ and the economy was deep in a recession. Different context. NYMO is the NYSE McClellan Oscillator (a breadth indicator). Going into the S&P 500’s bounce from last week, NYMO became very high. When this happens, the stock market tends to fall in the short term, and then make a medium term bounce. NYMO has now fallen, along with the stock market. It has gone from above 70 to less than 10. Here’s what happened next to the S&P 500 when NYMO rises above 70 and falls below 10 in less than 2 weeks. 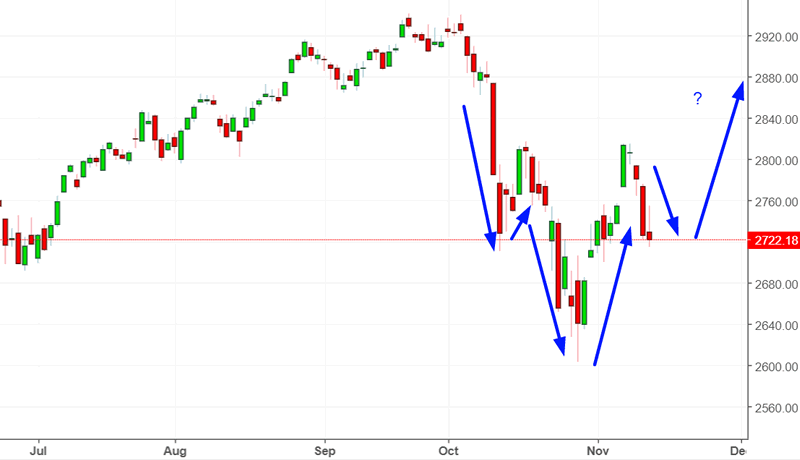 As you can see, the stock market tends to swing sideways in a volatile manner over the next 1 month (up and down), but it tends to go up 3 months later.